Destiny USA’s onsite 209-room Embassy Suites by Hilton hotel is your Spring Break Escape headquarters for 2019! Book your stay at New York’s largest shopping, dining and entertainment destination TODAY! 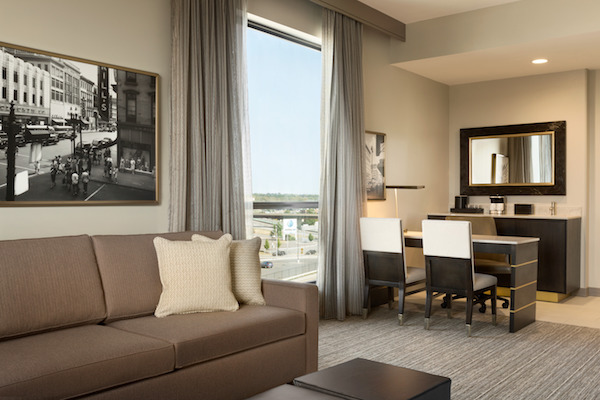 After a family day of play at Destiny USA, relax in one of the studios or one-bedroom suites featuring a separate living area with sofa bed and flat-screen TV in each room. Take advantage of the wet bar, refrigerator, microwave and complimentary WiFi. Treat yourself to a higher level room for beautiful views of downtown Syracuse. 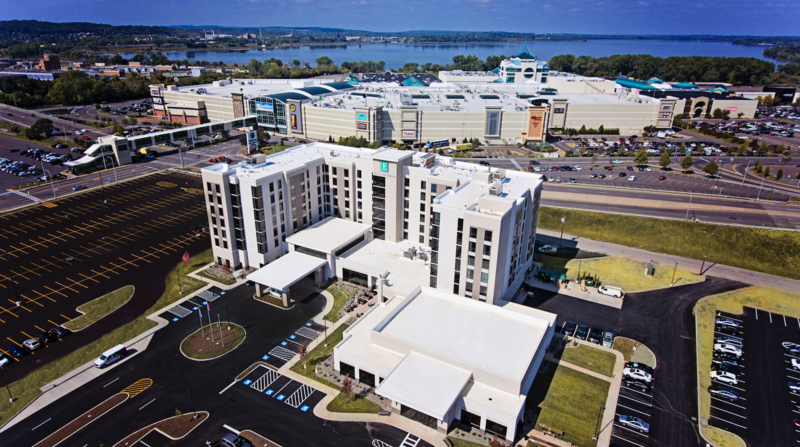 There’s simply no better way to visit Destiny USA and experience the best of Central New York. Plus, wake up every morning to a free made-to-order breakfast featuring omelets with your choice of fillings, potatoes, bacon, fruit, pastries and more. End a busy day of shopping or entertainment on Destiny USA’s 3rd level with drinks and snacks at the complimentary Evening Reception* in the beautiful atrium lounge. With your stay at Destiny USA’s first onsite hotel, you will enjoy extra perks, including added savings and convenience. 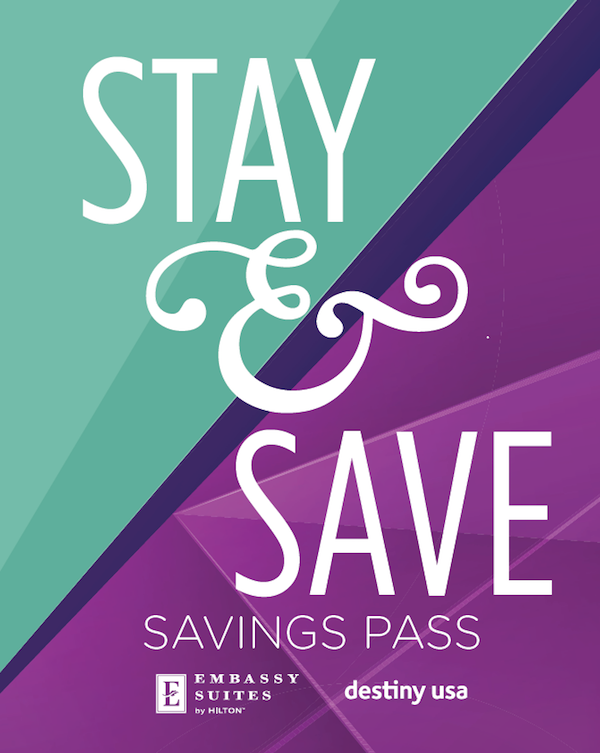 Book your stay and receive extra savings with the exclusive Destiny USA “Stay & Save” pass upon check-in. It’s full of deep discounts, freebies and deals at various Destiny USA shopping, dining, outlet and entertainment venues. Shop the day away at Destiny USA. And leave your shopping bags to us. 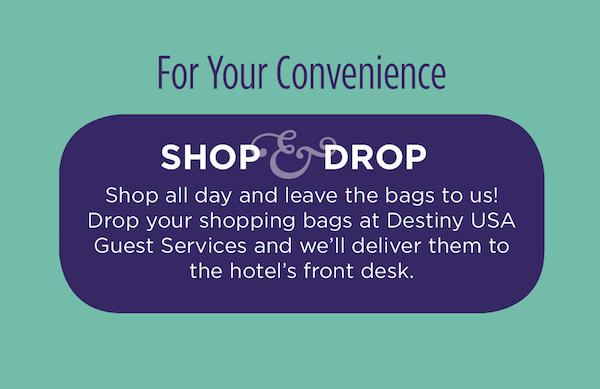 With our exclusive “Shop & Drop” shopping bag delivery service—just for hotel guests—simply drop your shopping bags off at Destiny USA’s Guest Services. The hotel will pick them up and deliver them to the hotel’s front desk. It’s that easy.